Do you think the media tries actively to hide people living very well with early dementia? Don’t shoot the messenger, but this is effectively a question which Norman McNamara, well known campaigner and a person living with dementia, asked on a public forum as follows. But when you think about it, you rarely get ‘success’ stories about or written by people living well with an early dementia. This phenomenon, to be fair, might be part of a wider picture, of the media tending to focus on bad news stories, or “shocks”. Not to generalise, but often irresponsible journalists have tended to sensationalise news stories anyway, “not letting facts get in the way of a good story”. It is thought that there are currently about 900,000 people currently living with dementia in the UK. Some of them are living well by the law of averages? But the question asked poses wider issues of more potential concern. Does the public need to be ‘scared’ in order to donate to a cause? Might it be effective to use the words “bomb”, “timebomb” and “flood” to shock people into action through donation to a dementia charity? The focus of efforts can of course be the elusive “cure”, with proponents arguing that cures for dementia have been denied resource monies compared to, for example, the cancer charities. It can also be argued that there is a genuine shock in the story, that it would be quite inappropriate to sanitise the dementia narrative. For example, almost every week there’s a new revelation about cuts in social care. As it happens, I had been thinking about a similar issue: on the nature of the term “dementia friendly communities”. When I asked her why, she said it is simply inappropriate to think of people with dementia as one huge group as they have differing needs and abilities. Maybe the term ‘community’ is meant to reflect this diversity though? I am physically disabled, and I have often thought about whether I would welcome a national policy called “disabled friendly communities”. In a way, giving a whole group of people a label negates personhood and individual identity. On the other hand, criticism of the term might be overly politically correct, and one should be intuitively positive about any initiative which is inclusive for people in society? The late Tony Benn used to explain his views on equality in terms of not forcing people to be equal. Benn argued that a more useful way to conceptualise the situation was to think of removing obstacles that made people more unequal. But I feel the question that Norman poses is an appropriate one. If we are to embrace truly the notion of a ‘dementia friendly communities’, we need to embrace the idea too that some people with dementia are inspirational and can be leaders themselves. The notion of presenting people living well with dementia is therefore a very important one, and to omit them from the narrative would be a very dangerous pursuit. That is, it would be if such a pursuit were deliberate: presumption of innocence, and all that. The BBC’s current political editor, Nick Robinson, calls this ‘bias by omission’, and, whilst we share rather different political perspectives perhaps, on this I feel Norman and Nick are together right. Previous PostThanks to Gill (@whoseshoes) for capturing the happiness of friends at my book launch for 'Living well with dementia'Next Post"Dementia friendly communities": would a rose by any other name smell as sweet? 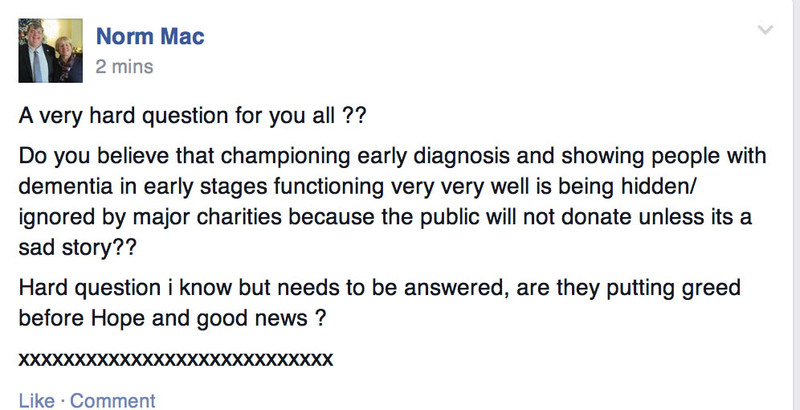 The question posed by McNamara was, were those in early stages being ignored/hidden by major charities? Not in our case. Indeed, my husband was used as the face of the launch of the Dementia Friends initiative in Wales, by the biggest dementia charity in the UK, the Alzheimer’s Society. He has mixed dementia at 52yrs. Hardly hiding him or presenting a sob story. Thanks Jayne and Norman very much.